Thanks so much for having me here today, Karen. I’m a native Pacific Northwesterner. I grew up on the Oregon coast and now live in a small town just west of Portland. When I’m not writing, I’m a substitute elementary teacher, though I’m cutting way back on my teaching so I can write more. I took the entire month of November off just to write. I used to bake a ton, but have scaled back on that since the kiddos left home. I do go all out for Christmas, though. I play around with amateur photography a bit, and my yard is a wildlife habitat. I have lots and lots of birds visiting my feeders year round. My favorite thing to do, though, is feed the fawns apples. After the last kidlet headed off to college, I found myself with time on my hands. I was only substituting part-time, and I’d played with the idea of writing a book for years. I have to confess, I never dreamed it would be a romance novel! But, when I parked myself in front of the computer in February 2011 and started tapping out an idea I had for a book, it was a historical romance—Highlander’s Hope. I currently only write historical romance—Regency actually, though I throw in a few Highlanders and gypsies to spice things up a bit. My romance genre of choice for reading has always been historical, so it made sense that I’d start my venture into writing as a historical romance author. I do have some ideas for other genres, however. They’ll just have to wait their turns. I have a love affair with words. I adore creating sentences and descriptions that I can go back later and read and think, “I wrote that?” I’m also a pantser, so I find it a lot of fun to see where my characters will take me or what the story will do that I hadn’t anticipated. Of the actual writing process itself, I’m not fond of editing. I always miss something, even though I’m a teacher. In the broader scope of writing, or perhaps I should say, being an author, I don’t care for marketing or promo. I’d rather spend the time writing. Gosh, all over. I’ve got a notebook I keep jotting story ideas down in. Sometimes I’ll have a scene pop into my head. Other times, I’ll be writing one book and I’ll create a character that has to have their own story. Just the other day while in the shower (that happens a lot, actually) I had another new story idea zip into my head. Then I have to charge out of the shower and write it down, or I’ll forget the details. A non-teaching day, I’m up at 5:30. I do a few chores around the house, workout, and try to be at my computer by 8:00. After checking emails and other social media, I start tapping away on my current work in progress. I try to set daily word count goals but depending on how much research I have to do, or if I have to write several blogs, I might not reach my goal. I generally try to wrap things around dinner time, but usually end up back on the computer to check emails again. Or , if I’ve thought of a great plot idea, I won’t want to wait to write it. On days I teach, I’m up at 5:00 and out the door at 7:30. I do check my social media at lunch and spend two to three hours after work plugging away on my WIP. That cuts in to hubby time, so he prefers the days I’m writing during the day. Of course, I sneak upstairs to my writing room as soon as he falls asleep on the couch! I find it more difficult to write or maybe I should say create my female characters. I’m not sure why, because as I woman I should be able to get into their heads. Maybe that’s the problem. I don’t want them to be me or be like me. 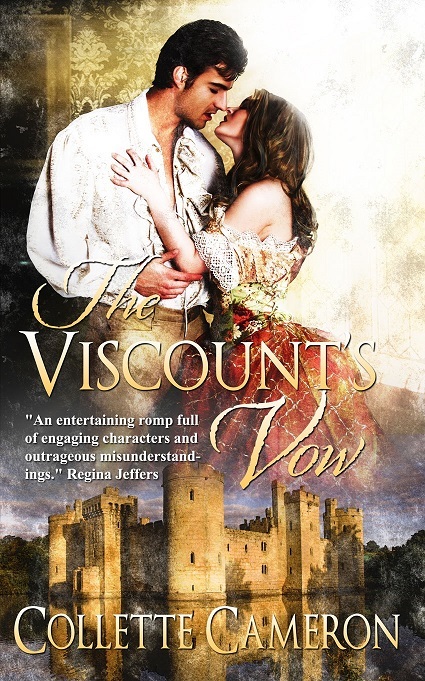 My most recent book, The Viscount’s Vow released in September. The third book in the trilogy, The Earls Enticement, I just sent off to the publisher, so I don’t have a release date yet. I’m guessing the spring of 2014. It’s about an unconventional Scottish noblewoman, Adaira Ferguson, who’d rather wear breeches and raise horses than abide by society’s conventions. Mistaking English nobleman, Roark Marquardt, the Earl of Clarendon, for his traitorous brother, she imprisons him in the dungeon of her family’s keep. Roark is none too pleased, and his retribution, when she finally realizes her mistake, is what leads to lots of sparks and eventual romance. BE SURE TO COME BACK to read more about Collette and her newest release, THE VISCOUNT’S VOW, on Wednesday’s Karen’s Killer Book Bench!! Happy Reading! **SPECIAL ANNOUNCEMENT: Collette will give away one copy of either her novel, HIGHLANDER’S HOPE or THE VISCOUNT’S VOW (winner’s choice), to one of her lucky readers who comments on her Monday Interview or Wednesday Book Bench blogs!! Don’t miss this chance to read this book!! Thanks, Collette, for sharing your stories with us! What gorgeous covers on your books! I love the sound of them. I found your comment about your female characters interesting. I sometimes have that problem too for the same reasons (even though parts of me undoubtedly creep in). Wishing you much success! I’m so sorry I didn’t get over here Monday, Karen.I tried to find the interview and couldn’t. I used the link from the post today to find it. Geesh is my face red. No worries, Collette. Sorry you had to search for it. :) We’ll be taking comments on both blogs all week before I pick the winner of your giveaway to give everyone a chance to stop in and chat with you. Thanks again for chatting with us this week!